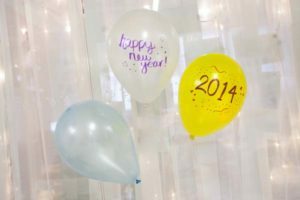 Sitting here just two short weeks into the new year I found myself reflecting on New Year’s Eve, when people all over the U.S. rang in the new year with various traditions. My family, for example, made a large pot of black-eyed peas and fried hog jowl to bring us lots of luck. Many people celebrate the coming year with a glass of champagne and a toast. Couples rang in the New Year with a kiss from their significant other at the stroke of midnight. For many people, watching the ball drop in Times Square as they count down the final ten seconds is a tradition in and of itself. Everyone hopes for success and luck in the new year, so we, like people in countries all over the world, combine unique traditions with personal resolutions as a foolproof recipe for guaranteed results. These are some of the more common traditions in the United States, but what traditions do people observe around the world? What superstitions or beliefs are observed in other countries? Where the Western Common Era calendar is used, New Year’s falls on January first. Where other calendars are used, such as the Islamic calendar in the Middle East and parts of Asia, the New Year is recognized as taking place in March. The Chinese New Year falls on a different date in January or February each year (for 2014, it takes place on January 31). Regardless of the time of year, traditions are unique to a country’s culture and current circumstances. In the Netherlands, it is common to make a bonfire in the street out of your Christmas tree to welcome in the New Year. In Germany, people enjoy predicting the future by melting small pieces of lead in a small spoon held over a candle and then dropping the pieces in cold water. Based on the shape of the hardened metal, futures are revealed. In many parts of Latin America and Spain, it is a tradition to eat twelve grapes at midnight to have luck for the twelve months of the coming year. In both Peru and Colombia, if you hope to travel in the upcoming months, you would do well to run around the block with your suitcase. Of course you will probably need some money to travel, so make sure you put on some yellow underwear before you set off for your trip, and if you want double the luck, wear it inside out. In Japan, dried beans are scattered throughout the house in each room to chase away evil spirits, and Buddhist temple bells are rung 108 times (for the number of beads on a Buddhist rosary). The bell ringing is often watched televised and is similar to Americans watching the ball drop in New York’s Times Square on New Year’s Eve. These are only a few of the many New Year’s traditions found throughout the world. I’d love to hear yours! Do you have a favorite New Year’s tradition? Let us know in the comments below. Thank you for such an interesting article. In Afghanistan New Year “Naw Roz” occurs around March 21st, give or take a couple of days. Now Roze means new day in Dari, the language spoken in Afghanistan. People go on picnics to enjoy the greenery, flowers and time with family. Another very interesting traditions on Now Roz is kite flying, a national pastime in Afghanistan, which is at the center of all these outings. I spent some time living in France and I always enjoyed “la galette des rois” (king’s cake) tradition. It is celebrated on January 6th and while it isn’t directly related to New Year’s, I’ve always associated the two. The tradition is basically this: you enjoy a cake with friends and family and the person that finds “la fève” (the charm), which is usually a little figurine, in the cake becomes the king or queen for the day. This person is also the one that gets the cake for the next year. In China, the lunar new year become much more important for each family member of Chinese, My family ,for example ,my mum had prepared for it for a long time, she have collected many foods(fish, pork ,prawn ,vegetable etc), our 2 ice boxes had already been fulled, my wife had bought some new cloth and socks for good luck. my son–Tony 12 years old– this year is his year,little pony. he had bought many favorite fireworks,crackers for fun. also to train his brave way. I just do the logistic work for this festival ,nothing to mention. the early eve of it , Istarted cooking fish and sour and sweet pork riblets,they cooked chinese salads and green vegetable dishes.there were 8 dishes for good luck wish.we enjoyed foods and watch gala programs by CCTV ,aroud 11:30 pm the firework time come,outside the window sounds like war. no kidding, you can imagine the situation.that is a small piece of culture presentation in Northeast China–Shenyang City. welcome to visit it.